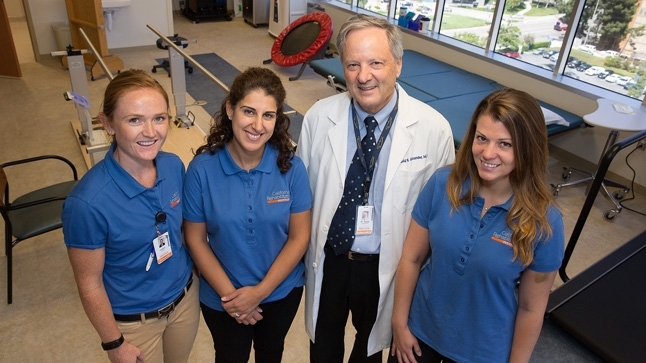 David Alexander, MD, with California Rehabilitation Institute staff members Isabel Burrows (left), Ellie Shaliesaboo (center) and Jessica Decker (right). In a unique joint-venture partnership, UCLA Health has joined forces with Cedars-Sinai Medical Center and Select Medical to open the West’s largest acute inpatient rehabilitation hospital. The California Rehabilitation Institute (CRI) welcomed its first patient on July 21. Located in Century City, CRI features 138 private rooms where patients can receive advanced treatments as they recover from brain injuries, spinal-cord injuries, stroke, orthopaedic injuries, cancer, neuromuscular illness, transplants and other health conditions. “We’ve pooled the expertise and talents of two of the nation’s most respected healthcare institutions to provide patients with the highest level of rehabilitation care possible,” says David N. Alexander, MD, medical director, California Rehabilitation Institute. Select Medical, a leading provider of rehabilitation services, manages and operates CRI. “For us, fostering this kind of relationship is part of our vision to develop a network that is able to draw on its shared research and knowledge to build a higher level of sophistication and clinical expertise in rehabilitation medicine,” says David S. Chernow, president and CEO of Select Medical. UCLA Health neurologists, including Dr. Alexander and Andrew K. Dorsch, MD, will see current and new UCLA Health patients at CRI. Hospitalists from both medical centers will provide care for patients from their respective centers with some crossover coverage when needed. “We expect California Rehabilitation Institute to quickly become a world-class leader in providing highly specialized care, advanced treatment and leading research that will help patients gain greater independence as they rebuild their lives,” says Dr. Alexander.